Best 22 Floor Jack Reviews of 2019 | Portable Car Jack Picks by Experts! How to Select the Best Floor Jack for the Money? We’re sure that it’s not only us that suffer roadside blowouts and are either missing a spare tire, floor jack, or both. You then have to sit on the side of the road waiting until a friend or family members comes driving up to with that smug looking smirk on their faces as they know that you’re now going to owe them for bailing you out of a tight spot. You then have to get home to a wife that then decides the best course of action is to constantly remind you that they told you to buy a spare tire/car jack 500 times in the last year. Again, this is all done in that smug tone of voice as they have been proven right – again. So, to ensure that you never have to go through any of that again, why not just get it done and dusted now by finding the perfect car jack to go with the new spare that you’re also going to buy? Think of the smug look that you yourself can display when you and the wife get a flat tire on the way to an important appointment/get together/shopping trip and you’re able to be the one to save the day by changing the tire in 3 minutes flat due to your floor jack! Finding the perfect jack has never been easier actually, because we have gone and done the legwork for you. There are 22 of them on this list that we deem to be good enough to mentioned as the best on the market and we’re confident that among them – you’ll find your dream floor jack. ASME PALD compliant, a superb lift range of 2.75 and 24 inches, extremely durable, a one-year warranty, and a dual pump mechanism that will have you at full height in just six pumps – simply put, a great floor jack. 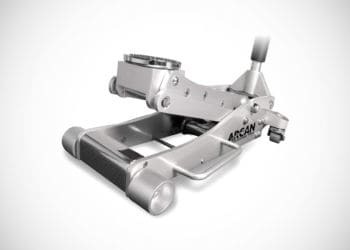 Kicking of our reviews is Arcan XL20 Low Profile Floor Jack and if you’re one of those lucky ‘BLEEP’ that owns a sports car, this should be one of the first that you check out. 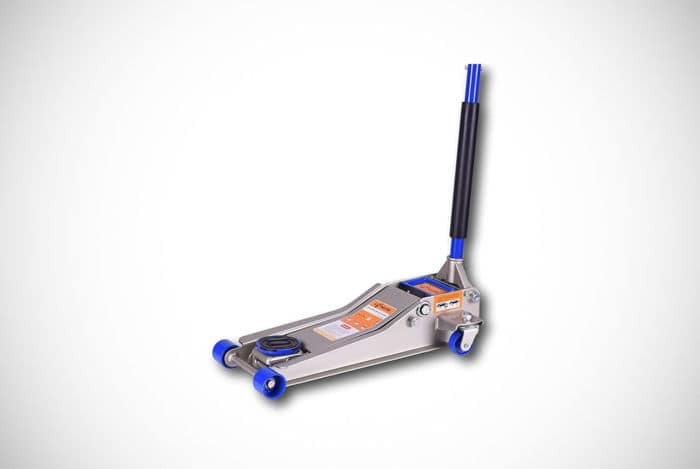 We’d actually say that this is one of the best low-profile floor jacks that money can buy right now as it has a lift range of between 3.5in and 18.5in and offers a great blend of portability and durability. 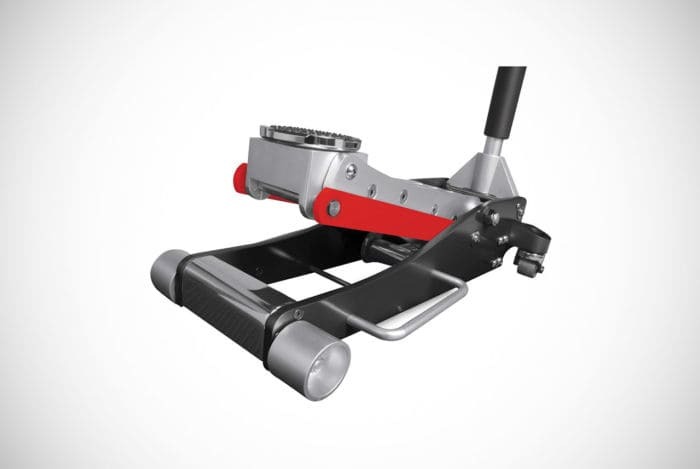 Steel construction means that this hydraulic floor jack is as durable as they come but also fairly heavy compared to those made from aluminum. Steel jacks do have a higher weight capacity though, so it all comes down to whether you prefer capacity or mobility. The XL20 has a 2-ton capacity so it’ll have no problem lifting smaller cars and even some medium-sized cars. Arcan does have a 3-ton variant if you’re concerned that your car may be too happy for this model. ASME standard approved, the Arcan XL20 also impressed us due to its efficient hydraulic system. You’re not going to have to bust your guts when pumping this baby as much as you’d have to with many of its competitors. 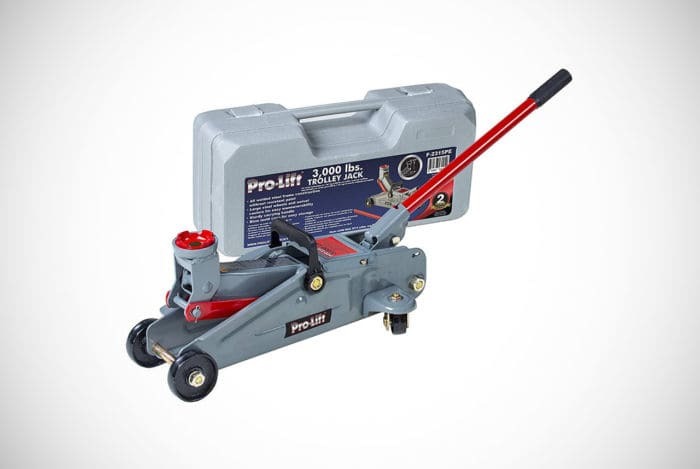 We’ve actually featured several floor jacks from Pro-Lift in this list and for very good reason, they have a very good reputation for manufacturing some of the most popular jacks in the business. Like the previous jack we reviewed, this is ideal for use on low profile cars and will be able to adequately lift all small cars at a height range of between 3.5in and 14in. 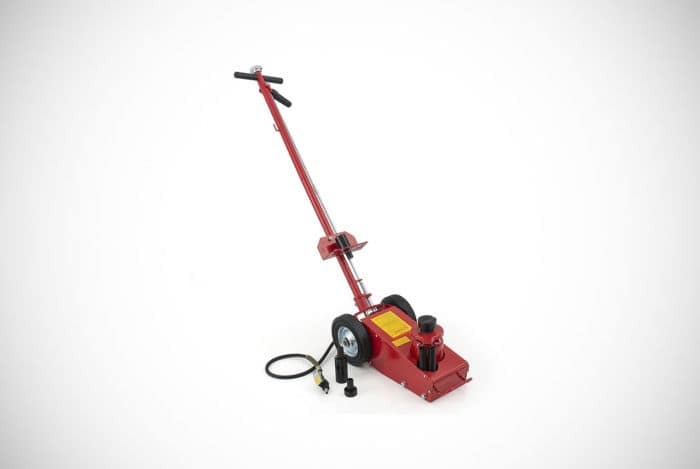 Popular in most of the floor jack reviews that we’ve seen online, this low-cost but highly portable steel framed hydraulic floor jack has a good mix of durability and portability. There are not many hydraulic jacks that are light enough to be carried in the trunk but strong enough to support up to two tons – this is one of them. If you’re looking for a hydraulic jack for your home, this is going to be more than adequate. However, we would recommend something a little more heavy-duty if you’re planning to use it regularly in a repair shop setting. That said, for the money, you’re getting a very nice floor jack that will give you good performance and reliability levels. If you’re in the market for something a little more robust and has the ability to lift heavier vehicles, this 3.5-ton Blackhawk B6350 Service Jack is going to be right up your street. Recommended for use in a service garage or for those of you that regularly perform work on larger vehicles, you won’t find it easy to find a better high lift floor jack than this. We have to warn you though, this well-built jack sacrifices portability in order to provide better robustness and weight capacity. It is heavy, so you’re not going to want to have to lug it around too much. That said, for that sacrifice, you get a jack that can lift as much as 3-tons to heights of between 5 and 21 inches. We particularly like that this floor jack has a 1-year warranty but other standout selling points include an efficient fast lift feature, a bypass device that prevents any damage from overpumping, and a patented saddle design. Not ideal for low-profile vehicles, however, so check out the two above if you require lifting low profile vehicles. There are not too many jacks that are constructed of aluminum and this is basically because steel is the stronger material. That said, aluminum is far lighter and the NOS NSJ0302 makes use of aluminum that is aircraft grade for added strength. On top of that, they have still made use of some steel reinforcement in key areas of this floor jack. You’ll be able to jack up cars that sit as low as 3.7 inches and will be able to lift anything up to three tons in weight up to a maximum height of 18.125 inches. We also have to say that the aluminum construction and design also make this one of the sexiest jacks on the market – that is of course if this matters to you! Complying with ASME PALD standards alongside some excellent safety features such as safety valves and a joint release mechanism also means that you’re going to be getting a jack that is as safe as anything out there right now. 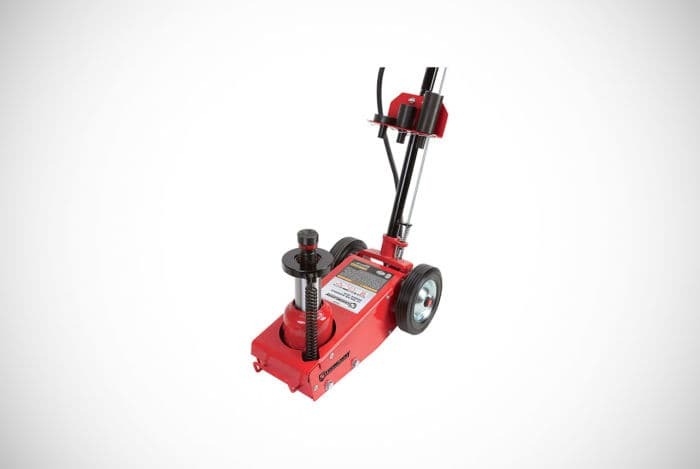 This is one of our favorite hydraulic floor jacks and therefore have no issues with including it on this list. 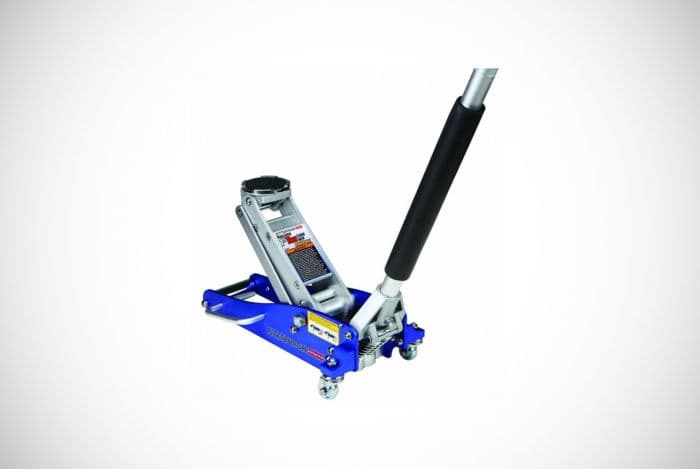 The Pittsburgh Automotive is a floor jack that excels in just about every department. Firstly, it can accommodate just about any vehicle due to its capacity of 3-tons and an exceptionally low minimum lift range of 2.875 inches. 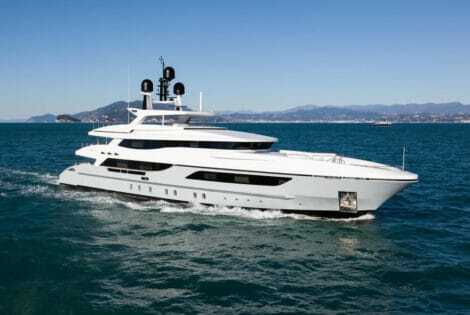 Secondly, and thirdly actually, its steel construction and very affordable price mean that it is both strong and excellent value for money respectively. 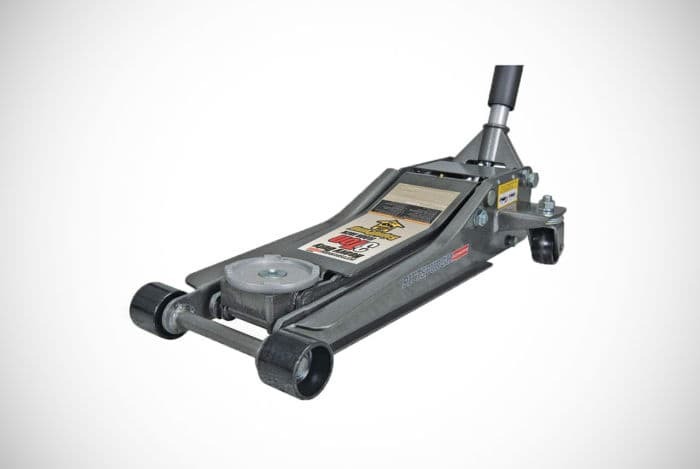 In terms of mobility, this is probably its weakest area but even here it is lighter than many other of the best floor jacks that are constructed of steel. The heavy-duty rollers on the bottom also aid it in this area by giving you the ability to move it around the floor quite easily. Using a double pump system, jacking your car up does not take nearly as much effort as is needed with many of its competitors, another big benefit with picking up one of these bad boys. We’re very impressed with Pittsburgh and that’s why you’ll notice a few of their other floor jacks in our list. This one in particular though has to be the best floor jack for the money in our opinion. 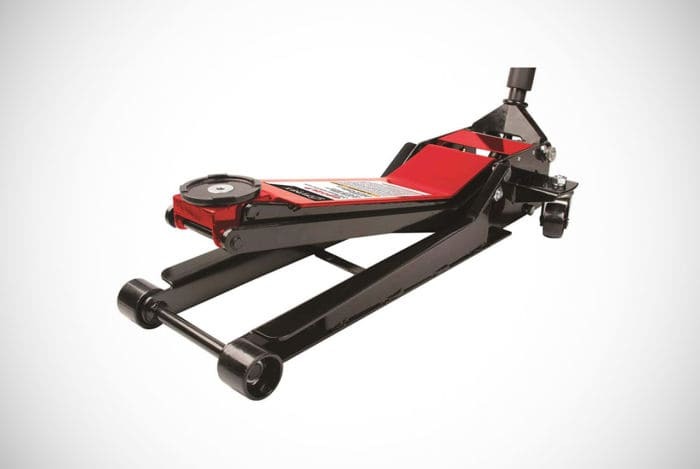 For the price, the Liftmaster 3-Ultra Low-Profile Steel Floor Jack is right up there when it comes to our favorite floor jacks. Once you get past its rather basic and uninspiring looks – you’ll quickly see that this jack has so much going for it. At the end of the day, who actually chooses a floor jack on how they look anyway? First of all, it has an excellent lift range of between 3in and 19.7in which gives it an excellent price to height ratio. That low starting point means that it can lift even the lowest of cars while the maximum height means that you can really get underneath a vehicle to get your work done. 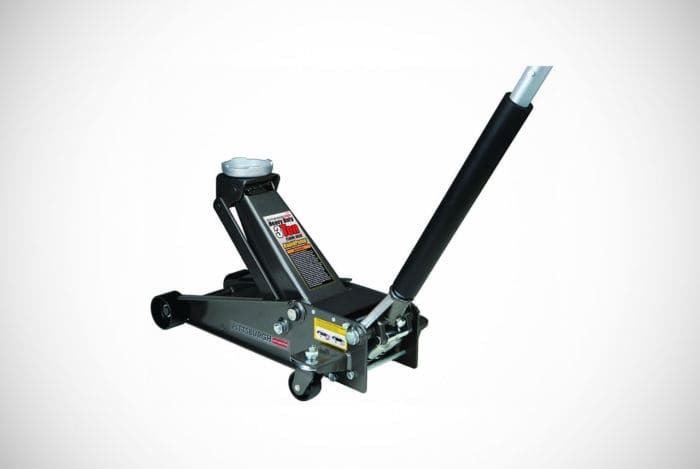 We also have to mention the high levels of durability that this steel-constructed 3-ton floor jack provides. Some other positives include a saddle that comes with anti-slip padding that adds an extra element of safety, the fact that you can pump a vehicle up to full height within ten pumps, and a foam coated handle that aids grip and helps to prevent scratch damage. All in all, the Liftmaster is a great jack at a great price and should be among your considerations. First and foremost, the big appeal with this floor jack is without a doubt the price. You’re not going to be able to find many other 3-ton jacks at this price, let alone any that gets as many good floor jack reviews. Sure, there are better jacks out there but they are going to cost you substantially more than the budget price that this one is available for. 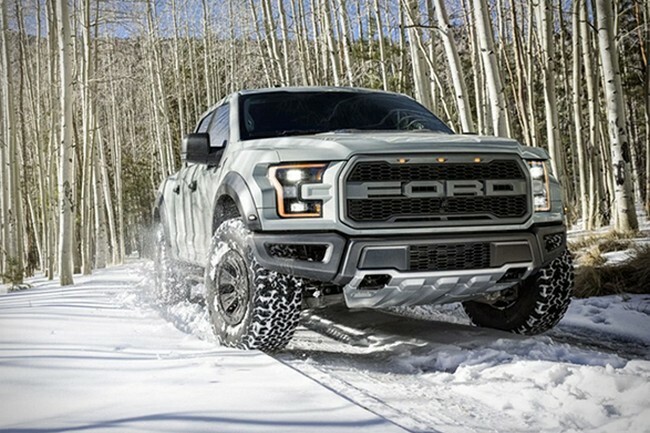 As for the specs, well, with a lift range of between 6 inches and 21 inches you can instantly see that this was designed for larger and heavier vehicles. If you have a low-profile sports car, we suggest you go and look at something that has a much lower base height. 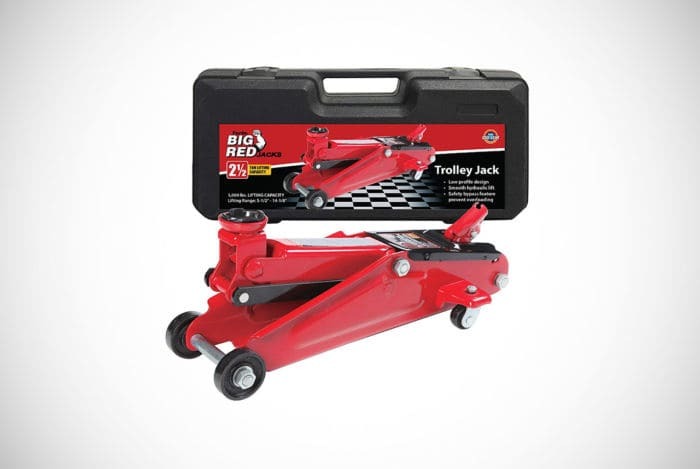 The Big Red does have a high maximum height which is great for larger vehicles and a big reason for this height is the long neck that the jack has. Another surprising thing about the Big Red here is that it’s not as heavy as you might expect. Yes, it’s heavy but not nearly as heavy as other heavy-duty 3-Ton jacks on the market. That and the fact that it has swiveling rear wheels means that getting the jack into the right position under the car isn’t going to be too difficult. 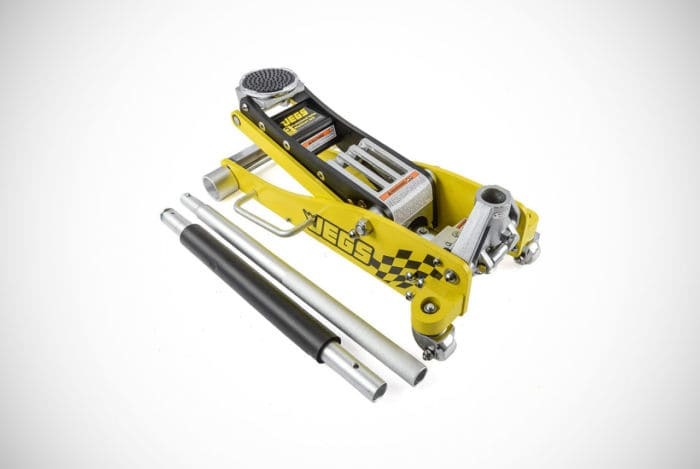 At the opposite scale to our last 3-ton jack above in terms of price comes the Jegs 80077 3-Ton Professional Floor Jack. This comes in at almost three times the price and certainly falls into the premium category. That said, this is definitely one of the best portable car jacks that money can buy for a number of reasons. 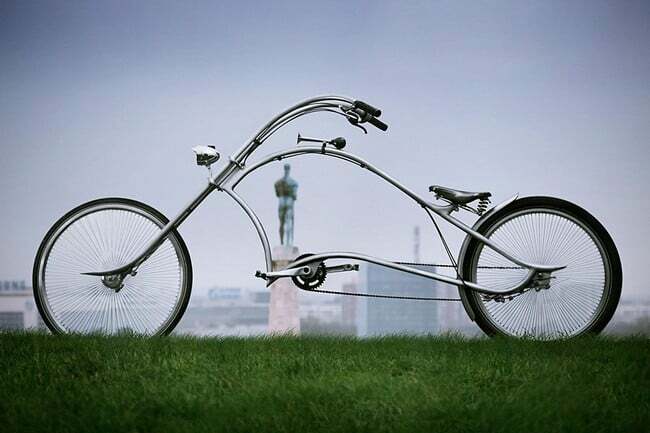 It has been constructed of lightweight aluminum which means that it’s far more portable than those made of steel. Additionally, because it’s a low-profile jack with a lift range of between 3.5 and 19.25 inches, you’re going to be able to lift almost any car. Where the extra price really comes into play however, is the additional features that budget jacks do not offer. One of these is a sealed hydraulic system which prevents dust and other debris from giving you issues, a safety valve that stops the jack from overloading, and a reinforced left arm. The icing on the cake is that this floor jack complies with ASME PALD 2014 standards. We also have to comment on the bright yellow coloring which not looks great but also makes it very easy to spot in even the dreariest of dreary garages. 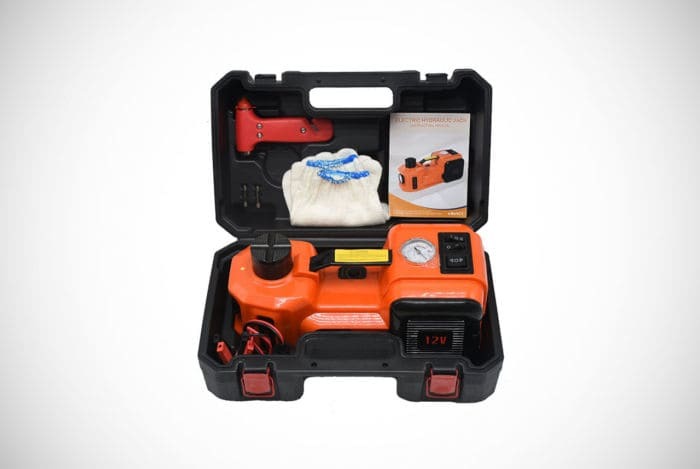 For all you lazy types out there that hate the thought of having to manually jack your car when a flat tire occurs, you’re going to absolutely love this electric floor jack, tire inflator, and flashlight from MarchInn. You’ll now have no trouble changing out that flat tire as you’ll have all of the tools that you need. You could even opt to take their more expensive bundle that even includes an electric impact wrench that even makes removing the wheel nuts a breeze! It should be noted that this jack is designed to be used sparingly and not in a workshop environment as we do not think it has the durability to hold up. However, as a kit to have in your car for when you need to change a tire on the roadside, this thing is a must have. All you have to do is hook it up to the cigarette lighter or even direct to the battery if you’re worried about blowing any fuses and you’re away. With a 5-ton capacity it can lift all small, medium, and large cars easily while most trucks and vans will also not pose too much problem. We just love the concept of having everything that you need in one handy kit and at the price, it really has to be considered great value for money as well. Designed to be used in a workshop environment, the Sunex 6603ASJ is another that has been getting some rave floor jack reviews. Made primarily from aluminum but with steel used in areas that need reinforcement, this 3-Ton jack offers up an excellent combination of durability and portability. In fact, its weight combined with its wide track wheels means that moving this jack around is something done with ease. As for the lift range, you’re looking at 6.5 to 19.3 inches and the great part is that it takes less than ten pumps to get it to the maximum. The not so great part is that you’re not going to be able to lift any car that has a lower profile than 6.5 inches. Of course, it’ll be fine for most road cars you’ll have to roll out a low-profile jack for anything too low. Other features include a handle side handle which also aids portability, a large anti-slip saddle pad that improves safety, and some good looks. On the latter however, we do which the colors were a little brighter but other than that it does look good. 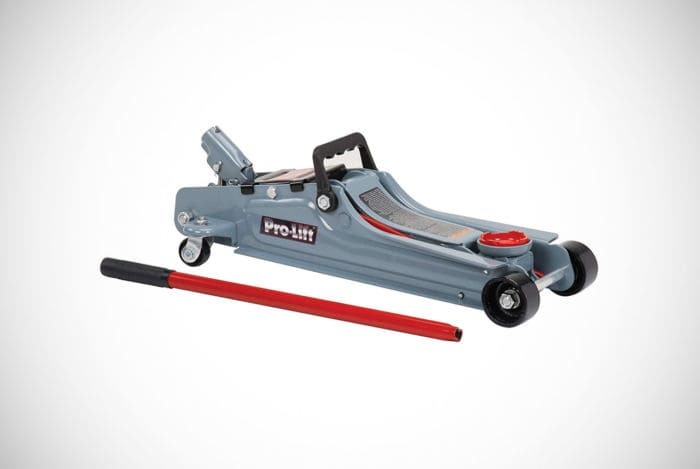 This is the second-floor jack from Pro-Lift on our list and the F-2315PE Hydraulic Car Jack certainly follows in the footsteps of their other affordably priced jacks. While we would not recommend this for extensive or workshop use, we do think that it is a jack that is perfect to have at home or even to be kept in the car. It weights just 288oz and has strong casters that allow you to move it around easily, a lift range of between 4.92 and 11.81 inches which is suitable for many cars, and a steel frame construction that means that it is more than durable enough. We should warn that with a max capacity of 1.5-ton, we do not recommend lifting anything more than a small car with this jack. As a budget jack for small cars, the F-2315PE is a very good option in our opinion. Sure, it has its limitations but for the money you’re getting great value. Another nice touch that also shows how portable this jack is, is the fact that it comes in its very own carry case. Another from the lower end of the spectrum in terms of price is another offering from the Torin Big Red range. This 2-ton hydraulic car jack certainly beats most for price but how does it hold up performance wise? Not too bad actually and we’d have no problem recommending this to have at home for when you need to get some work done under your car or as a cheap backup in a workshop. Designed to be lightweight, this jack comes packed in its very own carry case and can therefore be thrown in your trunk for those times in need at the side of a road. In terms of capacity and lift range, the Big Red can lift as much as 2 tons and has a range of between 5.6 and 13 inches. This makes it suitable for most smaller cars and some medium-sized cars but we would not advise trying to lift anything larger. As stated, this isn’t going to be your preferred option if you own a garage or workshop but it’s more than durable enough for occasional use. There’s even a safety overload system that will instantly prevent you from trying to lift anything too heavy – a feature that is always handy on a floor jack but definitely on one that’s as cheap as this one. 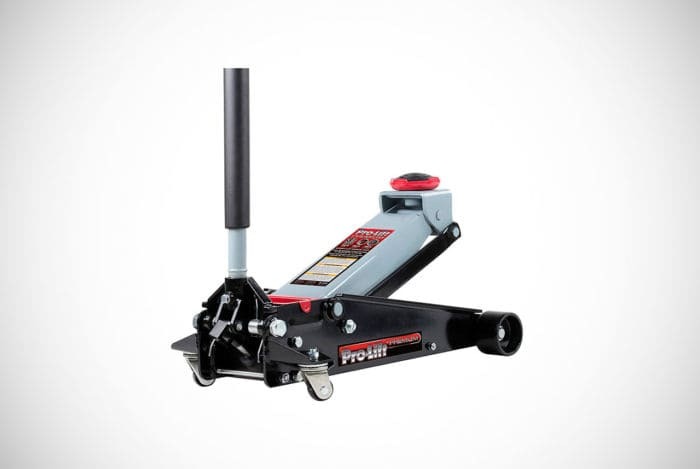 Constructed of aircraft aluminum for some serious durability and weighing just 640 ounces, it is clear to see why the Pittsburgh Compact 1.5-Ton Racing Jack it is the hydraulic floor jack of choice for many people. This is a premium jack both in terms of its price and of its quality and you really should be checking it out if you’re after something that can lift low-profile cars effortlessly. Why do we say effortlessly? Well, it takes just three or four pumps on this thing to lift small cars which when you consider that some jacks take ten or even fifteen pumps, you can see the effort that you can save with this thing. 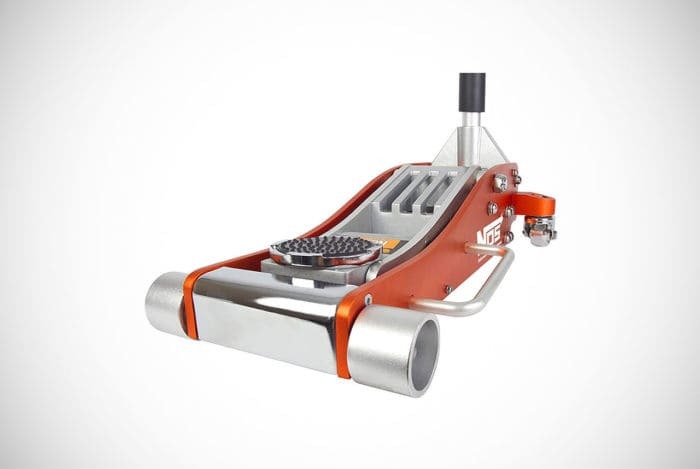 This is primarily down to the dual pump mechanism that this floor jack uses which allows for rapid lifting. This jack was actually designed with professional racing teams in mind as it gets the job done quickly without compromising on safety or durability. This is also clear due to the max capacity of 1.5-ton as racing cars are designed to be as light as possible so to allow them to travel quicker. It also looks great too – one of our favorites in this area in fact. NOS has made a series of top-quality portable car jacks over the years and the NSJ0301 is definitely one of their best. Primarily constructed of aluminum but with steel reinforcements where needed such as in the lift arm, this jack is fantastically lightweight but without losing out too much in terms of the durability that it provides. It literally weighs close to half the weight of other floor jacks made from 100% steel that is capable of lifting the same 3-ton weight. If you’re somebody that values being able to move your jack around a lot easier, this is certainly a jack that you should be taking a closer look at. Something else that will impress many of you is the fact that this can lift cars that sit as low as 3.75 inches from the ground. This means sportscars, in particular, can be lifted due to the ultra-low profile of the NSJ0301. Even most medium-sized cars and some SUVs can be lifted with this jack due to the weight capacity of 3t. Forget lifting your car, the ProForge 22-Ton Hydraulic Floor Jack will be able to lift a 10-story building. No, seriously, this thing can handle some weight and is ideal for any of you that need to lift any kind of heavy load or extremely large vehicles. What you have to remember is that jacks with this kind of capacity usually cost five times what this unit is selling for right now. Does that obvious value for money affect the quality that the ProForge provides? 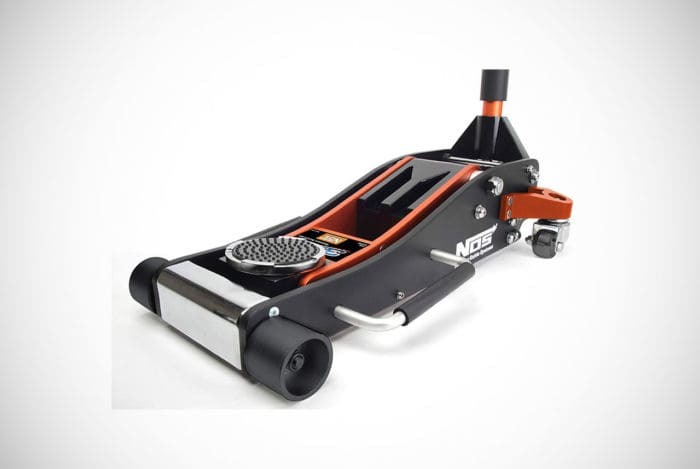 Well, it is probably not up there with some of the very best hydraulic/air floor jacks in terms of build-quality but at this price, you’re still getting yourself a very impressive piece of kit. Made from steel, you can be sure that it is robust and can take a beating and although it is heavy – would you really want to try and lift a bus, plane, or another heavy vehicle with something that wasn’t? This jack has a minimum saddle height of 8.5 inches and it can lift to a maximum height that is just over 10 inches. Well worth a look if you’re on a budget but want something that is both able and reputable to get the job done. The Performance Tool W1640 is another floor jack that will not break the bank and with a lifting capacity of 2.5 ton, you’re actually getting plenty of moneys worth. Compared to other jacks with the same or similar capacity, you’re definitely making some good savings with the W1640 and this is not at too much of a sacrifice to the quality of the product. This jack has a a decent lift range of 5 to 15.5 inches which might not be low enough for some sports cars but it’s certainly low enough to lift just about any other small-to-medium car. You’ll even be able to lift some light trucks with the W1640 but you really should check the weight of the vehicle before attempting to lift it. 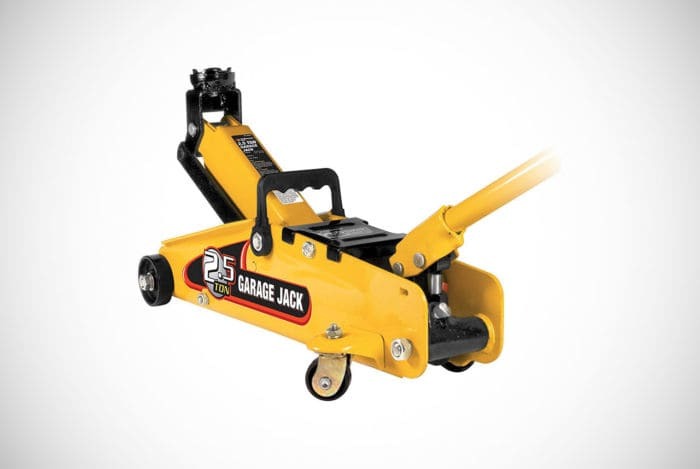 While the jack that we’re reviewing is 2.5-ton, they do have other weight capacities over at Performance Tools, so essentially you can get the same jack but with capacities ranging between 1.5-ton to 3-ton. If you’re going to be working on heavier vehicles, we certainly suggest you go for something with increased weight capacity. This is the third appearance for Pro-Lift with this one being the G-737 Speedy Lift Garage Jack. It offers a standard capacity of 3.5-ton which is more than enough for most cars, trucks, and vans. Furthermore, you can get your vehicle to the desired lift height with a number of pumps that you can count on just one hand. Small cars will take no more than four pumps while trucks might take one extra pump. Other areas of quality with the G-737 includes the saddle being rubber which protects the vehicle being lifted without sacrificing stability. Additionally, a universal joint release mechanism allows you to lower the jack more precisely which also protects both you and the vehicle. The build-quality of this jack is also at a high level as the car jack reviews that follow it will attest to. This might not be a gamechanger but one other neat little feature that we find handy is that of the magnetic tool tray. You can place nuts, bolts other metal items in here with the peace of mind that you’re not going to lose them around a hectic workshop. Summing up, this is a great all-rounder and one that we feel most of you will more than appreciate. 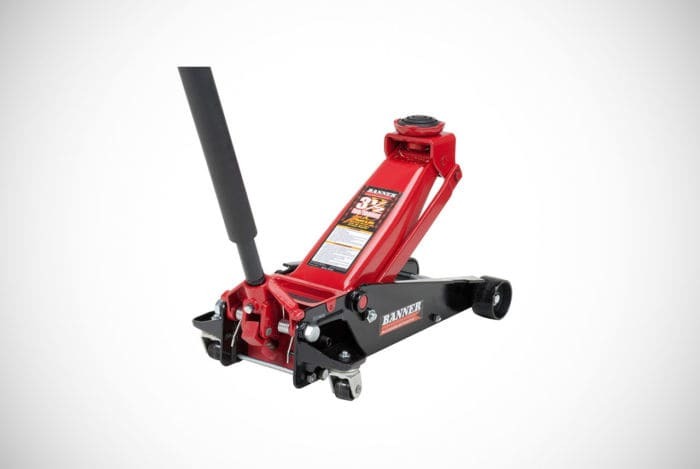 We’ve chosen the Sunex 6602LP 2-Ton Low Rider Service Jack as our ‘Editors Pick’ and you’re just about to find out why. This might be one of the more expensive jacks on our list but we have nothing but great things to say about it. It has a super low profile, makes use of rapid rise technology, is very maneuverable despite its heavy weight, and is as durable as they come. This jack has a minimum height of 2.75 inches which is low enough to lift even the lowest of cars and a maximum lift height of 24 inches. That is easily one of the best lift ranges that you’ll see on this list but it doesn’t just excel there. Through rapid rise technology, that lift can be experienced in just a matter of six or seven pumps. Furthermore, this jack is ASME PALD compliant, comes with a one-year warranty, and is constructed of industrial-grade steel that will ensure that it lasts for a good many years. Ideal for use at home or in a workshop environment, you’re not going to find many low-profile jacks as good as this one and that is why it is our favorite of the lot. You’re certainly spoilt for choice when it comes to the best hydraulic floor jacks as the Arcan ALJ3T 3-Ton Floor Jack is another great option to consider. This premium-grade floor jack has a lift capacity of three ton which is more than you’ll need to lift most small and medium sized cars and while you might think that this will have to have been constructed of steel to handle the load, it’s actually made from aircraft aluminum. That material allows it to retain its durability but with the addition of far more portability. It still weights quite a bit but not as much as you’ll find with steel-constructed floor jacks. As for the lift range with this particular jack, you’re looking at a minimum of 3.75 inches and a maximum of 18.25 inches which is going to be more than enough for most of you. This really is a high-quality jack that looks and feels durable, has a number of safety features such as bypass and overload valves, and which adheres to ASME PASE standards. Its dual pump pistons might not lift a vehicle as quickly as a few others in this price range but they still the job pretty quickly to make any lift and easy one. 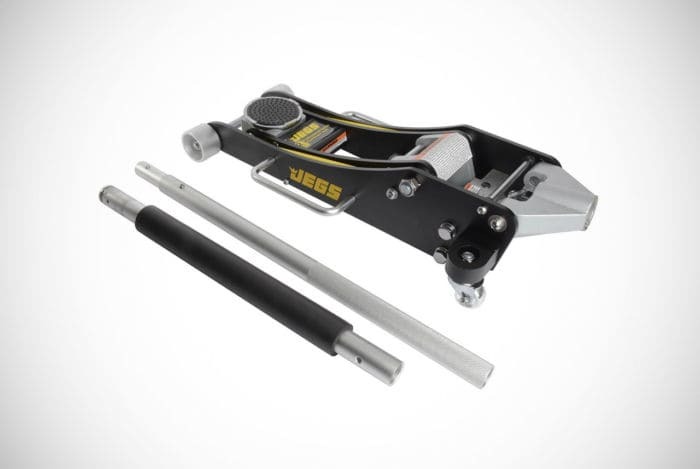 Jegs is another reputable brand when it comes to floor jacks and this low-profile 2-Ton Aluminum Floor Jack is definitely among their best floor jacks right now. Its capacity and minimum lift limit of 3.5 inches means that there are not many vehicles that it will not be able to get underneath. The 2-ton weight capacity also means that you’re going to be able to lift the majority of cars that’re on the road today. This has been designed to be as lightweight as possible without sacrificing on its durability and this is why it has been constructed of aluminum instead of steel. This means you’ll be able to store it in the trunk of your car if needs must while it’ll also work as a professional level jack in a workshop environment too. Rubber lift pads, knurled grips, and adhering to ASME PALD standards is where the safety aspects come into play and each of these really do mean that you can have a peace of mind that you have a quality floor jack from a very reputable manufacturer. The price might be the only issue but once again, you’re paying for some of the best quality available. The penultimate floor jack on our list is another from Pittsburgh that has to be among the very best car floor jacks available today. As one of the most expensive we’ve reviewed, it would be understandable if you’ll be a little put off but like many others int his price range, you’re really getting the ultimate in quality for your money. 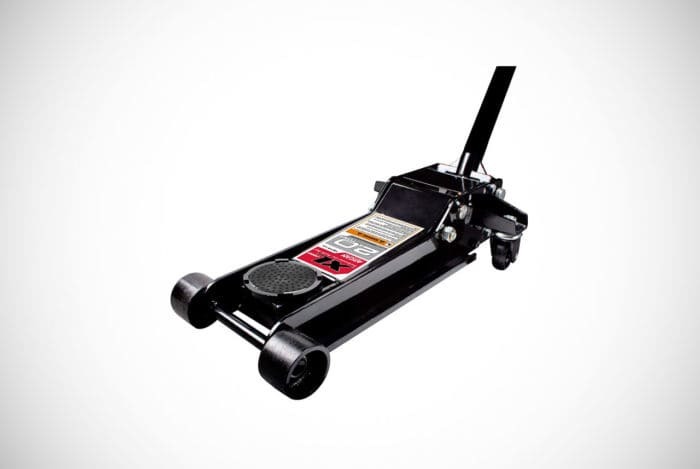 This 3-Ton Heavy Duty Floor Jack is constructed of heavy-duty steel, has a lift range of between 5in and 18.25in, and will be able to lift pretty much any car and even some smaller trucks. The best part is that it’ll only take five pumps to get the jack to its maximum height, something that many other jacks on this list can compete with. In fact, you’ll only need three and a half pumps to get to the ideal height for most cars that you use it on! As you might expect from a steel-constructed floor jack, it is on the heavy side but it still does offer decent mobility. This is primarily because of the steel casters and wheels which allow you to push and pull it to where it needs to go. Those combined with a minimum height of 5 inches means that you’ll be able to get under and lift pretty much all cars that are not overly low-profile. Bringing our list of our 22 best floor jacks to a close is that of the Strongway 22-Ton Air/Hydraulic Service Jack. This uses an air motor to lift just about any heavy loads that you can imagine but, in your case, this is obviously going to be cars, trucks, and other vehicles. That said, with a capacity of 22-ton, there is very little that it’s not going to be able to help you lift. Built from rugged steel, durability is never going to be a concern and with large 8-inch wheels, moving the jack into position can be done easily and efficiently. Safety is also a big focus of this Strongway service jack which is showcased via safety overload protection and it meeting ASME PALD 2009 standards. Admittedly, this jack might offer a little too much for many of you that are just after something that can lift your car. However, if you work as a mechanic or need to lift other machinery, industrial equipment, or the largest of farm vehicles, this is certainly a jack you should be considering. The price is also very appealing when you consider the weights that it’ll have no trouble lifting. There are several different types of floor jacks on the market and each will be better suited to different uses and environments. Some will be ideal for carrying around in your car in case the inevitable flat tire occurs when you’re late for that all-important date, meeting, wedding, or fortunately when you’re meant to meet the girlfriend for a shopping trip. On the other hand, some jacks are better used at home or in a repair shop as they’re simply too heavy to pick up and move around. You’ll also have to consider what you’re going to be using your jack for before purchasing one. Yes, we know, you’re going to want to lift your car! Well, some of you might own an SUV or even a truck, so different types of jacks or at least their max capacity will have to be considered. Scissor Jacks – These are the type of jacks that will be ideal for carrying around in your car. When your tire goes pop these will give you the ability to lift your car just enough for you to be able to change your tire. One thing they will not be able to do, unfortunately, is to stop your girlfriend/wife from whining about being late for that aforementioned shopping trip. 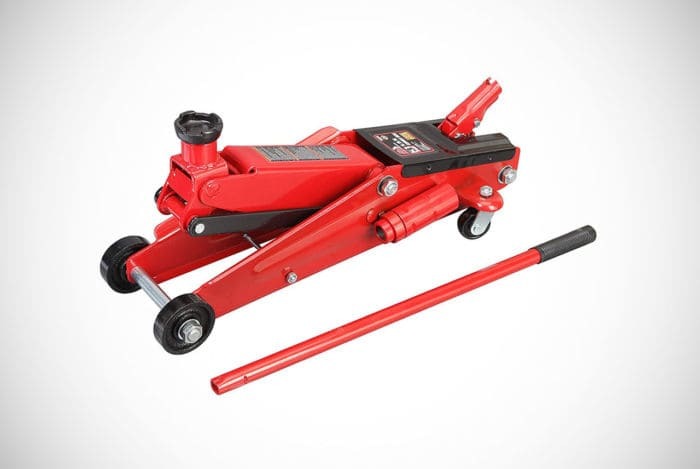 Hydraulic Jacks – Now unless you’re Dwayne Johnson, a hydraulic jack is not something that you’ll want to be lifting up too often or storing in the trunk of your car. These things can weigh a lot and are designed to be used at home or in a repair shop environment. Rather than being mechanical jacks like their scissor cousin, these are operated by pumping fluid into a cylinder with the generated pressure forcing the car upwards. Piston/Bottle Jacks – Piston jacks which are otherwise known as bottle jacks simply because, well, they look like bottles, are a good option when it comes to elevating large weights. Due to their standing height however, they’re not going to be suited to lifting vehicles that are lower to the ground such as sports cars. No floor jacks are the same and will be able to handle different weights, lift these weights to different heights, and will be able to fit under differing heights of cars. They’ll also be made of different materials, use different pumping mechanisms, and will be available at a variety of prices. All of the above will have to be considered before you make your choice on which floor jack to purchase. Weight/Mobility – Even the lightest of floor jacks can weigh a fair amount but some do weigh a lot less than others, so if portability or mobility is something that you’ll need, you’re going to have to look at the lighter models among our list. A heavy-duty floor jack is not going to be ideal for the trunk of your car while a lighter jack should not really be used regularly in a workshop environment. Lifting Range – The lifting range of a jack is also a very important consideration before buying. You’ll have to make sure that the jack is low enough to be able to get under the vehicle that you want to lift and that it’ll be able to lift that vehicle high enough for you to be able to get underneath it. Capacity – This is how much weight that the jack can safely lift and support. Generally, 1.5 to 2-ton floor jacks will be able to support most small cars but if you wanted to be able to lift larger cars, vans, and even trucks, you’re going to need a 3-ton jack at the very least. Make sure you know the weight of the vehicles you want to lift before choosing the weight capacity that you need for your floor jack. Construction – Most floor jacks will be constructed of steel, aluminum or a combination of the two. These are the only two materials that are considered strong enough to hold the sort of weights that you’ll need to lift with steel being the strongest and aluminum being the lightest. Therefore, if you wanted a jack that is easer to move, you’ll probably want the latter but if you’d prefer a bit more durability, the former should be your first choice. Price – While the cost of the jack that you’re buying should not be the biggest priority, it will of course be important for many of you. Some jacks can cost a small fortune but it’s hard to argue against them being worth it but there’s also some great budget floor jacks that will more than do the job that you need. Operating a floor jack is pretty simple once you know how to do it – in fact, even the birdiest of bird brains among you will have no trouble pumping away at your favorite model. That triggered your dirty minds, right? However, it’s important that you also know how to operate your floor jack in as safe a manner as possible. The last thing you’ll want to do is injure or kill yourself, or worse yet, damage your car. Find the Most Even Surface Possible – It’s hugely important that you move your car to a surface that is even as possible. You do not want to risk the car pushing over the jack or jack stands and falling off of them – especially if you’re working on the car at the time. Chock the Wheels – You should always chock the wheels of the car, especially on the opposite end from where you’re lifting it. This is to prevent any rollback from occurring as the vehicle is lifted. This should be done even if you’re certain that the surface you’re lifting on is perfectly even. Always Use Jack Stands – Never rely on the car jack alone to support the vehicle that you’re working on – if that jack was to fail, you’re in trouble. Jack stands should be placed under the car in the places that your cars manual states. These will help the jack to support the weight of the car while you perform the necessary work. Raise and Lower Car Carefully – Never rush whenever you’re lifting or lowering the car in order to prevent damage to the car, the jack, and of course, yourself. When pumping you should also keep an eye on the car to make sure that it’s lifting safely and looks stable. When lowering, doing it gently will enable the car to make contact with the ground in a stable manner. That is some list we’re sure you’ll agree and we’re confident that what we’ve listed above will be among the very best hydraulic jacks that money can buy. Don’t be thinking back to this buying guide when you’re stuck on the side of the road, wishing you’d bought one. 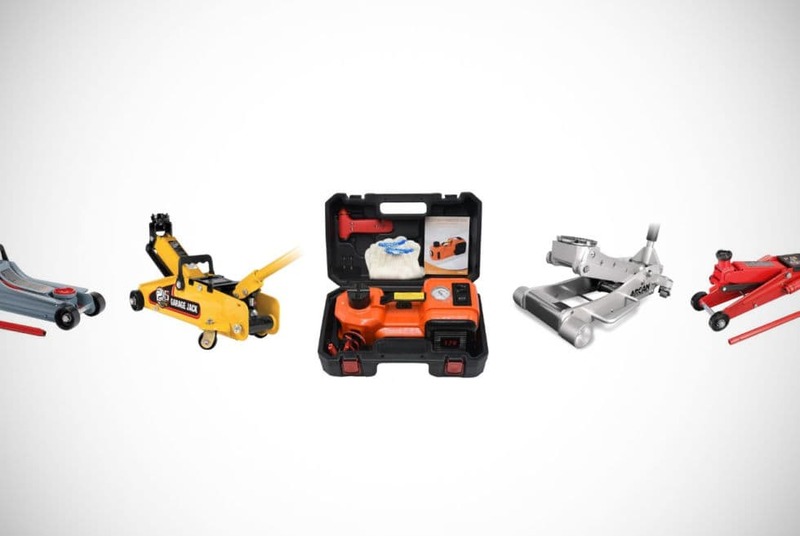 We’ve made a point of catering for all kinds of budgets with our selection so that there is something for everyone while we’ve also tested all of the above and checked out the many online floor jack reviews to get other people’s opinions. We’ve also made sure that we have included a good selection of weight capacities, lifting ranges, and the overall weight of the jacks so that you’ll be able to find something that suits your particular needs. Just make sure that you already know what you’re looking for in these departments as there’s nothing worse than buying a jack that is unable to support the weight of your car or indeed fit underneath it. To put things as politely as possible, if you’re unable to find your best floor jack out of that lot above – we give up! 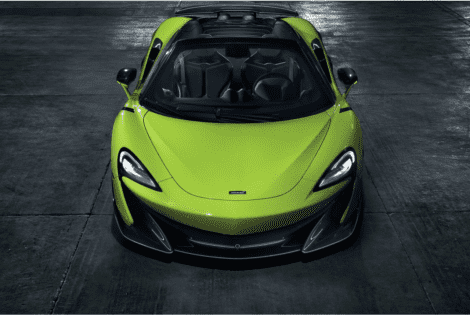 The famed Longtail lineup welcomes its fifth-generation model with the McLaren 600LT Spider and its ready to race both on the road and the track.